Road safety is something that we, adults, practice every day. From knowing when and how to use the pedestrian lanes to following the different traffic signs — all of these are engraved in our minds (at least, that’s how it should be). However, things are very different with kids. When they’re indoors, you can monitor everything that they’re doing to ensure that they’re safe. But when the little ones are outside, things can get out of hand fast. It should come as a no-brainer that road safety is a crucial part of our everyday lives. According to statistics, more than 1,600 children under 15 years old and below die in road crashes in the U.S. What’s more alarming is that one in every five children who were killed in the accidents were pedestrians. These statistics are very frightening indeed which means that there’s no perfect time to teach your kids road safety than now. The sooner they learn, the better. So if you haven’t started yet, get going. For little angels aged one and below, always strap them safely and securely in their car seat. When shopping for the best car seat for a one-year-old, take into consideration how well they fit in the car, the size and weight of the seat, and the ease of installation. There is but one problem though: teaching road safety rules to children is usually difficult and time-consuming. The time-consuming part can quickly be dealt with so long as you accept the fact that it’s your job to help your kids understand the rules. It will take time but I assure you, it’s worth it. If anything, the teaching part is what you need to focus on more. Kids, especially the younger ones, only know one thing — to have fun. Getting their attention to learning road safety can be very challenging even for the most seasoned parents. In addition to that, kids can get bored fast. For this reason, the best way to teach them is by incorporating things they enjoy the most. That’s right! I’m talking about games and fun activities. At their age, learning while having fun is the best method to teach them. They’ll not only be open to learning new stuff, but they’ll also be able to retain the information better. Take a look at the following road safety games and activities for kids that they’ll enjoy for sure. Songs such as nursery rhymes are a great way to entertain children. Using their favorite songs, you can teach them basic road safety rules. All you have to do is change the lyrics of the song to something that contain information about road safety. This song is probably the most famous of all nursery rhymes out there. Meaning your little one will not have a hard time remembering the song – and what each of the three traffic lights stands for. But of course, you can try other songs as well to suit your child’s taste (or hearing). This game is best suited for babies who have already started to walk, toddlers, and preschoolers. Although one child is enough to play the game, multiple players are more than welcome to make the game even more exciting. You start by preparing the materials needed for the game. All you need to do is draw or print pictures of traffic and road signs. Cut the signs out and have them laminated so they won’t get damaged easily. You’ll never know when you might need them again. Blu tack the laminated picture of a sign to the wall at your child’s eye level. 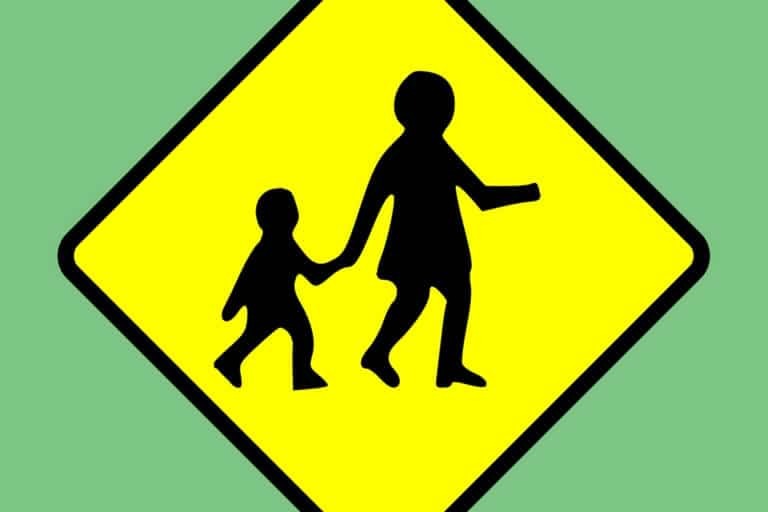 The game begins by having your child stand on the opposite end of the sign, pretending that he’s a pedestrian. The goal is to have him or her cross the made-up road crossing while following the traffic signs correctly. Change the signs on the wall as you wish to ensure that your child understands and memorizes each of them. The game gets even better when your child gets the hang of crossing the ‘street’ with the guide of basic traffic signs. For instance, you can add sounds to the game like that of a vehicle approaching even when the light is green. In this scenario, your child should stop crossing even if the sign says otherwise. To make the game even more fun, give your child treats whenever he or she follows a traffic sign correctly. Another great way to teach kids road safety in a fun way is through quizzes. Encourage your child’s competitive spirit by answering questions to test their knowledge of road safety rules. If your child has siblings, it’s better to have everyone participate. What’s nice about this game is you don’t need props of any kind to play the game. You can even play this game while walking outside with your child. Ask him or her what that road sign means on the corner of the road. Point to any other signs you see to test how well they know the basics. However, make it a point to ask the questions when you’re on the safe side of the road. To improve the game further, you can consider doing charades as another form of a quiz. Each participant will take turns in acting out the clues while the rest try their best to guess the sign. Whoever gets the most number of correct answers receives a prize. Surely, nothing beats a game with something on the line, like a sweet treat in this case. The internet is a massive world with lots of information and content about almost anything. It’s true that you should limit the time that your kids spend on browsing the web. However, it’s also true that everything’s not so bad about the internet. There are other things that you can do to teach your kid road safety. But what’s most important is for you to practice what you preach. Set a good example for your children. Abide by traffic rules and regulations and see to it that you follow road safety guides to the fullest. Kids will learn many things at school, but they’ll be spending more time at home. It’s crucial that you lay the path that they’ll follow until adulthood. And that’s being a responsible citizen at all times.